Background: Anemia in pregnancy has remained a public health challenge in the developing countries. The emerging epidemiological and nutritional transitions as well as the decrease in malaria burden make investigating other causes of anemia imperative. We hypothesized that high body mass index (BMI) might contribute to anemia in pregnancy in malaria-endemic regions. Materials and Methods: Using a two-stage sampling technique, we interviewed 338 pregnant women and antenatal care attendees at primary health-care centers in Ibadan, Oyo State. Blood and stool samples were collected from all the study participants. Thick and thin blood films were prepared for the identification of malaria parasite while Kato–Katz technique was used for quantification soil-transmitted helminthes in the stool samples. Multivariate logistic regression analysis was performed to assess the association between malaria and high BMI with anemia while controlling for the established causes of anemia in pregnancy. Results: The prevalence of anemia was 47.9%. 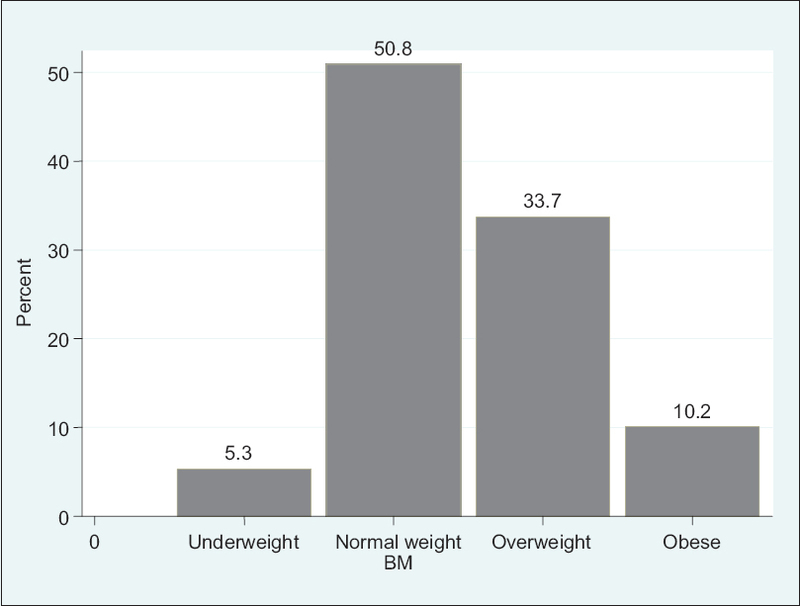 About half, 50.8% of the study population had normal weight while 43.8% were overweight/obese. Malaria (AOR 2.54 and 95% CI: 1.40 - 4.61), gestational age (AOR: 1.96 and 95% CI: 1.18–3.25), and being overweight/obese (AOR: 1.96 and 95% CI: 1.18–3.25) were associated with anemia in pregnancy. Conclusion: Malaria remains a significant cause of anemia in pregnancy, but the association between BMI and anemia will require further investigation among the Nigerian pregnant population. Keywords: Anemia in pregnancy; malaria; obese; overweight. Anemia in pregnancy has remained a public health challenge in sub-Saharan Africa because of its contribution to maternal and perinatal morbidity and mortality., In Nigeria, anemia in pregnancy affects more than 40% of the pregnant population in spite of the various interventions targeting its major causes , which are mostly nutritional deficiencies (iron and folate) and parasitic infections such as malaria and soil-transmitted helminthes (STHs), particularly hookworm infestation. Pregnancy-related immune suppression increases risk to these parasitic infestations in high-risk regions such as Africa  while HIV/AIDS and sickle cell hemoglobinopathy are also important contributors causes. Anemia in pregnancy results in adverse fetomaternal outcomes such as cardiac decompensation, intrauterine growth retardation, and low birth weight and birth asphyxia. Every year, approximately 25 million pregnant women are at risk of malaria infection. It has been estimated that malaria during pregnancy causes up to 10,000 maternal deaths each year, mainly as a result of severe anemia, it also accounts for approximately 8%–14% of low birth weights and 3%–8% of infant mortality. Malaria causes anemia largely by destroying red blood cells, an association well documented in scientific literature., The thrust of interventions for all pregnant women living in malaria-endemic areas in Africa includes intermittent preventive treatment with sulfadoxine-pyrimethamine in pregnancy (IPTp), insecticide-treated bed nets (ITNs), and effective case management all of which have been shown to reduce the occurrence of anemia in pregnant women by reducing placenta parasitemia., However, McClure et al., while studying the association between parasitic infections and maternal and fetal anemia in Kenya, had suggested a need to examine other causes of anemia in malaria-endemic regions in view of the apparent reductions in the burden of malaria in pregnancy which is attributable to the use of IPTp and ITNs. Nigeria just as other, low, and middle-income countries (LMICs) is undergoing an epidemiological and nutritional transition which involves dietary changes from food rich in fruits and vegetables to refined, energy-dense, and fatty foods as well as low levels of physical activity. This has led to an increase in the occurrence of obesity among women of reproductive age. While the association between poor nutrition and anemia has been well established, its association with high body mass index (BMI) has been scarcely explored in Nigeria. Therefore, we conducted this explorative research to investigate the potential contributory role of a high BMI to anemia in pregnancy among antenatal care attendees in Ibadan, Oyo State, Southwest Nigeria. We conducted a cross-sectional study using a two-stage sampling technique to select 338 pregnant women that were receiving antenatal care at six primary health-care centers (PHCs) within two purposively selected semi-urban local government areas (LGAs) in Ibadan, Oyo State and Ido and Akinyele LGAs, Ibadan, Oyo State. Then, the three most functional PHCs with the highest antenatal care attendances were selected from each LGA. Study participants were proportionately allocated, and all consenting women were serially recruited into the study until the sample size was reached. Pretested, interviewer-administered questionnaires were used to obtain information on the sociodemographic, maternal characteristics as well as the use of malaria preventive measures and hematinics. Participants' packed cell volume (PCV), genotype, weight in kilogram, height in meters, and HIV status were obtained from clinic records. Data were collected first from October to December of 2015 and from August to October 2016. Sterile lancet blades were used for finger prick and capillary tubes were used to collect blood for PCV. Two additional drops of blood were collected on a grease-free microscope slides for thick and thin films for malaria parasite test. The PCV levels were determined after centrifuge spinning and estimated using a hematocrit reader with cutoff for anemia being set at values <33%. The thick and thin blood films were prepared to determine the presence of malaria parasites using Giemsa staining technique. Freshly passed stool samples were also collected using wide mouth bottles and examined for any helminthes ova or protozoan trophozoite or cyst. Direct wet preparation stained with iodine and Kato–Katz techniques was employed for quantification of egg per gram of stool sample. Approval to implement of the study was obtained from the Oyo State Ethics Review Committee. Participation in the study was voluntary, and confidentiality was ensured by identifying the study instruments with codes. The results of the tests – malaria parasites, STH, and hemoglobin levels – were made available to the participants with the provision of proper treatment where necessary and subsequent follow-up by their health-care providers. The data were analyzed using Stata version 13. 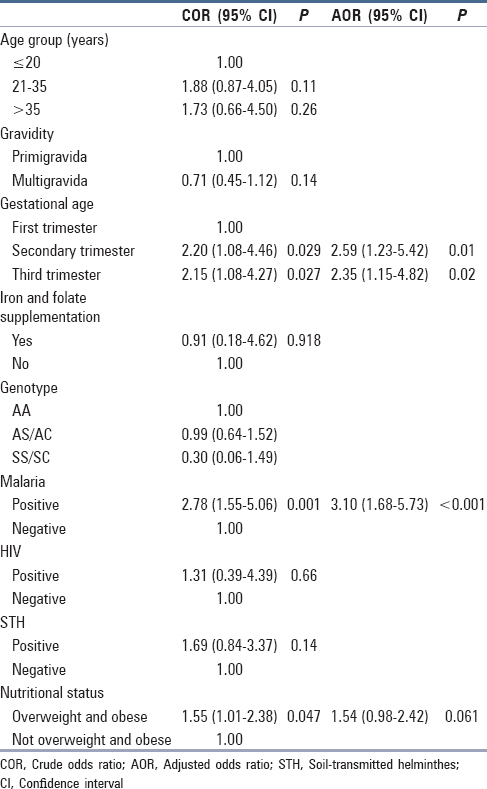 The primary dependent variable was anemia in pregnancy (PCV <33%). The independent variables were sociodemographic factors, malaria parasitemia, presence of STH, and maternal BMI. Others include gravidity, gestational age, use of folic acid/iron tablets, genotype, HIV status, IPTp, and bed net use. Multivariate logistic regression analyses (crude and adjusted odds ratios and 95% confidence interval [CI]) were performed to establish determinants of anemia in pregnancy among the study population. Overall, 338 consenting pregnant women effectively participated in the study. The prevalence of anemia in this study was 47.9% while the prevalence of HIV was 3.3%. Charts and box plots were used to illustrate frequencies, whereas [Table 1] reports the association between sociodemographic and other-related factors. Multivariate logistic regression was used to identify variables that were independently associated with anemia and to adjust for possible confounders [Table 2]. [Table 1] shows the sociodemographic and clinical characteristics of the pregnant women by anemia status. The mean age and mean gestational age were 27.5 ± 5.6 years and 25.7 ± 9.2 weeks, respectively. Majority of the women were above 20 years (90.5%), married (90.8%), had at least secondary school education (79.9%), and about one-third were primigravidae (34.3%). Almost all women reported the use of IPT (94.4%) as well as folate and iron supplementation (98.2%). Anemia was more prevalent among unmarried women (51.6%), those with low-level education (57.4%), primigravidae (53.5%), nonuse folic acid or iron tablets (50.0%), and HIV positive (54.5%). The proportion of anemia varied with gestational age being commoner among women in the second (50.8%) and third trimesters (50.3%) compared with the first trimester (31.9%). [Figure 1] shows the nutritional status of pregnant women. While about half, 172 (50.9%) had normal weight, 114 (33.7%) were overweight, and 34 (10.1%) were obese. 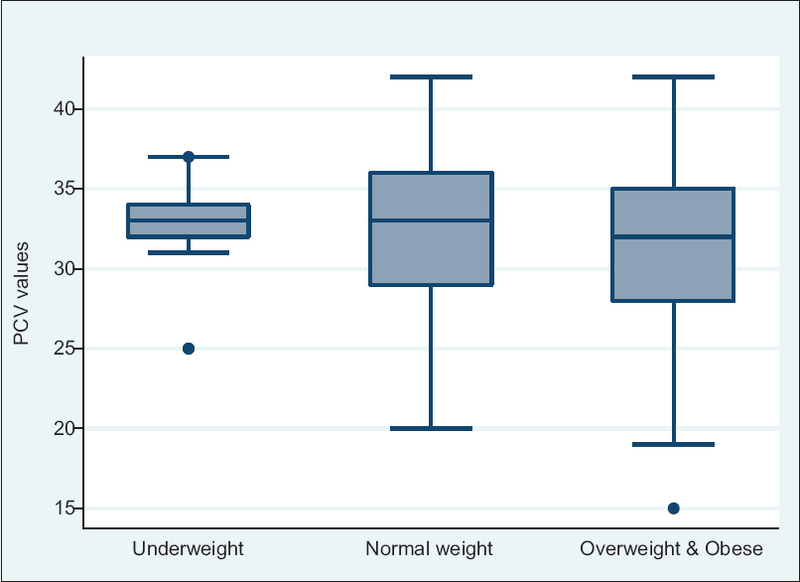 The box plots in [Figure 2] show the distribution of the participants' PCV by their nutritional status with median values of 33% for underweight, 33% for normal weight, and 32% for both overweight and obese. [Table 2] shows the results of the logistic regression model with crude and adjusted odds ratios of the predictors of anemia in pregnancy among the study participants. Gestational age significantly increased the odds of anemia in pregnancy; women both in the second Crude Odds Ratio (COR) 2.20 (1.08–4.44, P = 0.028) and third trimesters COR 2.15 (1.08–4.27, P = 0.027) were two times more likely to have anemia compared with those in the first trimester. Malaria parasitemia COR 2.78 (1.55–5.06, P = 0.001) and being overweight/obese COR 2.78 (1.01–2.38, P = 0.001) also increased the likelihood for anemia in pregnancy. After adjusting for gestational age, malaria remained a strong predictor for anemia adjusted odds ratio (AOR) 3.10 (1.68–5.73, P < 0.001) and being overweight/obese AOR 1.54 (0.98–2.42, P = 0.061) became less statistically significant. Anemia in pregnancy has remained a problem of public health importance in Nigeria. The prevalence rate of 48% for anemia in this study is higher than earlier reports by Dairo and Lawoyin in a similar study conducted among similar population over a decade ago  although lower than rates reported in recent studies within the country.,,,, In our study, almost all the women reported the use of IPTp and iron/folate supplementation. It is believed that the persistence of maternal anemia in spite of the uptake of necessary interventions will hinder the efforts being made nationally to reduce the burden of perinatal and maternal mortality in Nigeria. Malaria in pregnancy is still a public health concern in spite of the reduction in the burden of infection in the past few years., In our study, the prevalence of malaria was 18% and was also the strongest predictor for anemia. This implies that malaria preventive strategies, namely, IPT and ITN remain a relevant public health intervention among pregnant women in malaria-endemic countries. The World malaria report of 2017 confirmed an appreciable scale up with the use of malaria control strategies as evidenced by a five-fold increase in the use of IPTp in 36 African countries and an increase in usage of ITNs in sub-Saharan Africa from 30% to 54% between 2010 and 2016. Importantly, women who were overweight or obese were noted to have 50% significantly higher risk of anemia on univariate analysis which became less significant after adjusting for gestational age. Gestational age may be a mediator of the association between overweight/obese and anemia through gestational weight gain. The loss of statistical significance can hardly annul the clinical and public health relevance of this finding which suggests that being overweight/obese might be an independent risk factor for anemia in pregnancy among our study population. This is partly because because our study may be inadequately powered to fully explore the association. Furthermore, this finding is a departure from what was previously known and documented in scientific literature, particularly in the developing countries where undernutrition has often been associated with anemia in pregnancy., The global obesity epidemic is associated with a double burden of malnutrition in which undernutrition coexists with obesity in many LMICs. In this study, the prevalence of overweight and obesity was 34%–10%, respectively, compared with 5.3% who were underweight. This nutritional shift has resulted from urbanization, dietary and lifestyle changes. Obesity during pregnancy has become an issue of public health significance because of its role as a major risk factor for adverse maternal outcomes such as gestational diabetes, hypertension, and preeclampsia. Although the relationship between maternal obesity and anemia is yet to be well established, it may be related to the inadequate dietary intake that is common among overweight/obese persons as a means of weight control as well as intake of foods with low nutrient density. In support of this postulation, scientific evidence that links obesity-related anemia to iron deficiency has begun to emerge outside Nigeria. The inverse relationship between increased BMI and iron deficiency was first established among obese children in the developed countries. Nead et al., in 2004, examined the association with weight status and the risk of iron deficiency among 9698 children and adolescents and found that the prevalence of iron deficiency increased in a stepwise fashion as BMI increased. In addition, Zimmermann et al., in 2008, investigated the association between BMI and iron absorption in three countries in transition – Thai, Morocco, and India – and found out that independent of iron status and high BMI z-score was associated with decreased iron absorption. They, therefore, conjectured that the current surge of overweight and obesity in transition countries might impair efforts to control iron deficiency in LMICs. Nonetheless, there is a paucity of evidence for this relationship between obesity and iron deficiency among pregnant women, particularly in the developing countries. Abbas et al. in a recent study that assessed the association between high BMI and iron deficiency in 432 pregnant Sudanese women reported that a significantly higher number of obese women had iron deficiency. Even though our study has drawn attention to the possibility of an evolving association between anemia and maternal nutritional status particularly being overweight or obese, the findings have to be interpreted with caution because of certain limitations. First, was our inability to determine the prepregnancy BMI which would have provided an insight into the nutritional status of the women before pregnancy. However, it is pertinent to note the difficulty in capturing prepregnancy BMI as most pregnancies were unplanned, and the prepregnancy weight is often unknown, especially in the developing countries. In this study, BMI at contact was used as a proxy measure of nutritional status, which also would have captured gestation weight gain. In addition, the iron status of the women was not assessed, and hence, our suggestion of an association between obesity and anemia will require further elucidation. Inspite of these limitations, our findings suggest that being overweight/obese might be additional risk factor for anemia in the light of the epidemiologic and nutritional transitions taking place in Nigeria. More importantly, it draws the attention of African researchers to the possible emergence of a plausible association between anemia and high BMI. Hence, this calls for further research on the association between iron status, maternal BMI, and anemia among Nigeria pregnant population using a more robust methodology. In addition, we found that malaria in pregnancy remains a significant predictor of anemia among pregnant women thus giving credence to the need to sustain and continue to scale up the use of malaria preventive commodities in endemic countries like Nigeria. Khan KS, Wojdyla D, Say L, Gülmezoglu AM, Van Look PF. WHO analysis of causes of maternal death: A systematic review. Lancet 2006;367:1066-74. World Health Organization. The Global Prevalence of Anaemia in 2011. Geneva: World Health Organization; 2015. [Last accessed on 2018 May 01]. World Health Organization. Worldwide Prevalence of Anaemia 1993–2005. WHO Global Database on Anaemia. Available from: http://who.int. [Last accessed on 2018 May 01]. Anorlu RI, Oluwole AA, Abudu OO. Sociodemographic factors in anaemia in pregnancy at booking in Lagos, Nigeria. J Obstet Gynaecol 2006;26:773-6. Gyorkos TW, Gilbert NL. Blood drain: Soil-transmitted helminths and anemia in pregnant women. PLoS Negl Trop Dis 2014;8:e2912. Mpairwe H, Tweyongyere R, Elliott A. Pregnancy and helminth infections. Parasite Immunol 2014;36:328-37. World Health Organization. WHO Recommendations on Antenatal Care for a Positive Pregnancy Experience. World Health Organization; 2016. Available from: http://www.who.int/reproductivehealth/publications/maternal_perinatal_health/anc-positive-pregnancy-experience/en/. [Last accessed on 2017 Aug 18]. Steketee RW, Nahlen BL, Parise ME, Menendez C. The burden of malaria in pregnancy in malaria-endemic areas. Am J Trop Med Hyg 2001;64:28-35. World Health Organization. A Strategic Framework for Malaria Prevention and Control During Pregnancy in the African Region. Brazzaville: WHO Regional Office for Africa; 2004. World Health Organization. Guidelines for the Treatment of Malaria. 3rd ed. Geneva: World Health Organization; 2015. [Last accessed on 2018 May 01]. Okpere EE, Enabudoso EJ, Osemwenkha AP. Malaria in pregnancy. Niger Med J 2010;51:109-13. McClure EM, Meshnick SR, Mungai P, Malhotra I, King CL, Goldenberg RL, et al. The association of parasitic infections in pregnancy and maternal and fetal anemia: A cohort study in coastal Kenya. PLoS Negl Trop Dis 2014;8:e2724. Egwunyenga OA, Ajayi JA, Duhlinska-Popova DD. Malaria in pregnancy in nigerians: Seasonality and relationship to splenomegaly and anaemia. Indian J Malariol 1997;34:17-24. Akpanabiatu MI, Ayatse JO, Ifere GO, Itam EH, Umoh EB. The effect of changing living standards on iron status in pregnancy in Calabar urban. J Trace Elem Med Biol 1999;12:201-4. Onoh RC, Lawani OL, Ezeonu PO, Nkwo PO, Onoh T, Ajah LO. Predictors of anemia in pregnancy among pregnant women accessing antenatal care in a poor resource setting in South Eastern Nigeria. Sahel Med J 2015;18:182-7. Dairo MD, Lawoyin TO. Socio-demographic determinants of anaemia in pregnancy at primary care level: A study in urban and rural Oyo state, Nigeria. Afr J Med Med Sci 2004;33:213-7. Olatunbosun OA, Abasiattai AM, Bassey EA, James RS, Ibanga G, Morgan A, et al. Prevalence of anaemia among pregnant women at booking in the University of uyo Teaching Hospital, Uyo, Nigeria. Biomed Res Int 2014;2014:849080. Ezugwu EC, Mbah BO, Chigbu CO, Onah HE. Anaemia in pregnancy: A public health problem in Enugu, Southeast Nigeria. J Obstet Gynaecol 2013;33:451-4. Okoh DA, Iyalla C, Omunakwe H, Iwo-Amah RS, Nwabuko C. A retrospective study of the prevalence of anaemia in pregnancy at booking in Niger Delta, Nigeria. J Obstet Gynaecol 2016;36:594-7. Zama I, Argungun IB, Yakubu A, Taylor JR, Osaro E, Suzette U. Socio-demographic and obstetric factors associated with anaemia among pregnant women in Sokoto, North Western Nigeria. Health Sci Res 2014;1:119-26. Steketee RW. Malaria prevention during pregnancy – Is there a next step forward? PLoS Med 2014;11:e1001734. World Health Organization. World Malariare Port 2017. Geneva: World Health Organization; 2017. Available from: http://www.who.int/malaria/publications/world-malariareport-2016/report/en/. [Last accessed on 2018 May 16]. Yang W, Li X, Li Y, Zhang S, Liu L, Wang X, et al. Anemia, malnutrition and their correlations with socio-demographic characteristics and feeding practices among infants aged 0-18 months in rural areas of Shaanxi province in Northwestern China: A cross-sectional study. BMC Public Health 2012;12:1127. Ransom EI, Elder LK. Nutrition of Women and Adolescent Girls: Why It Matters. Population Reference Bureau. Available from: http://www.prb.org/Publications/./Nutrition. [Last accessed on 2018 May 01]. Nead KG, Halterman JS, Kaczorowski JM, Auinger P, Weitzman M. Overweight children and adolescents: A risk group for iron deficiency. Pediatrics 2004;114:104-8. Zimmermann MB, Zeder C, Muthayya S, Winichagoon P, Chaouki N, Aeberli I, et al. Adiposity in women and children from transition countries predicts decreased iron absorption, iron deficiency and a reduced response to iron fortification. Int J Obes (Lond) 2008;32:1098-104. Abbas W, Adam I, Rayis DA, Hassan NG, Lutfi MF. Higher rate of iron deficiency in obese pregnant Sudanese women. Maced J Med Sci 2017;5:285-9.